What with Game of Thrones dominating TV, and Lord of the Rings forever changing epic fantasy movies, there’s a real hunger for clashing swords, chaps in chainmail, and horseback posing. Thrones and Rings are complete fantasy, divorced from the actual middle-ages, but there are heaps of excellent movies out there set in what we’d recognise as ‘the real’ medieval times. What follows is a list of actual, proper medieval movies - ones that reflect the time and the myths we associate with them. They’re grounded in reality even if they don’t always stick to it. For that reason, magical fantasy like Lord of the Rings and The Hobbit doesn’t make this list, but stuff like Season of the Witch does. No order here - just the best of the best, fighting as one. You'll find some of these in our best Netflix movies list. And some on our best Amazon Prime Video movies list. There have been several adaptations of this most famous of Shakespeare plays over the years, and the latest - starring Michael Fassbender - is damn good. Macbeth is firmly set in the medieval era, and features all the trappings of the period - clashing sword fights, power-struggles between the nobility, and plenty of messing about in the woods. This version isn’t afraid to spread the blood around either, really capturing the brutality of the story in a way stage struggles to do. Fassbender is great as an angry, tortured Macbeth and Marion Cotillard makes for an excellent Lady Macbeth too. It isn’t a subtle retelling of the story, but that’s no bad thing at all. One of the best movies ever made, and set firmly within medieval Japan, Akira Kurosawa’s story follows a bunch of villagers who hire a band of samurai to protect them from raiders. Performances from the likes of Toshiro Mifune, as Kikuchiyo, are outstanding, but it’s Kurosawa’s cinematography that truly highlights the medieval setting. There’s a dirty desperation to the villagers, who are sharply contrasted against the noble (equally poor) samurai, and the epic battle at the movie’s conclusion, set in the pouring rain, is some of the finest battling ever committed to screen. A classic - but one that stays potent to this day. Ok, this one splits opinion. Braveheart puts its own spin on historical events, and its anti-English sentiment plays heavily on the millennium-long rivalry between the Celts and the Saxons. Even ardent Scots balk at all the fake jingoism in the movie, while some can’t get enough kilt-lifting and freedom-crying. Like I said, it’s divisive. However, it remains a very watchable movie and some of the fight-scenes and plot-points are often imitated, but rarely bettered. 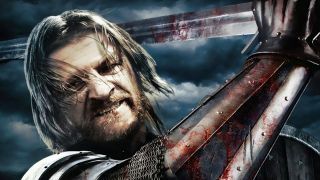 Game of Thrones has done medieval battling better, and given us more intrigue, but there are few things on the silver screen to match the pomp and scale of Braveheart. A good medieval movie isn’t one that necessarily takes itself too seriously. Errol Flyn’s rather camp take on the Robin Hood legend is good fun, while still staying true to the legends on which it’s based. There’s a lot of fawning around in trees, with the main characters grinning at each other. It’s one to watch on a rainy Sunday afternoon, when you don’t quite want to deal with the medieval squalor that became more prevalent with post-Golden-era Hollywood movies. Also of note is the soundtrack, which won an Oscar that year. Deservedly so too. Following The Lord of the Rings trilogy, Sean Bean has lacked a mega-hit, despite making some interesting choices amidst the more pedestrian fare he's since turned out. It's a shame that more people didn't catch Black Death, as is it played up to Bean's strengths by casting him as grizzled Knight Ulrich. The atmosphere is suitably pustulant and grimy, and there's an interesting supernatural twist to Ulrich's mission. The Holy Grail was followed by Life of Brian, which stole a lot of the attention away from this equally hilarious effort. But Holy Grail did at least get a renewed boost of interest when it was adapted into stage-musical Spamalot. Absurd comedy highlights include the knights that say “Ni!”, the French insults ("I fart in your general direction"), the optimistic Black Knight ("It's just a flesh wound"), and, of course, the killer bunny. Jean-Jacques Annaud adapted Umberto Eco's ultra-postmodern novel about medieval monks into this Sean Connery-starrer. Connery is monk William of Baskerville, whose forward-thinking ways are called upon to solve a series of murders that are occuring in the monastery. The studio weren't keen on Connery, but there's great pleasure to be had from his medieval 'tec. You could pretty much insert your favourite Robin Hood movie (and there are quite a few to chose from) into this entry, depending on your preferred man-in-tights, be it Errol Flynn, Russell Crowe or Disney's fox. Costner may not be everyone's favourite Hood, but there's no disagreement when it comes to the supremacy of Alan Rickman's Sheriff. Prince of Thieves is perfect Sunday afternoon entertainment with relentless swashbuckling, an implausibly impressive treehouse community, and (of course) the showboating Alan Rickman on top form. Oh, Wild Card! If Sam Raimi made a bit of a tonal shift between the first two instalments of the Evil Dead series, it was nothing compared to the leap he took for the third movie. Army takes its cue from the bizarre ending of Evil Dead 2 (a shotgun-wielding Ash is transported to medieval England and hailed as a hero) and runs with it, having gleeful fun homaging Harryhausen with legions of stop-motion deadites. This was the first big movie that Heath Ledger carried as the lead, having impressed in 10 Things I Hate About You, Two Hands and The Patriot. Director Brian Helgeland threw any notion of historical accuracy out of the window for this tale of a peasant who dreams of becoming a jousting champion knight. The laddish camaraderie is more convincing than the romance, but this is still bags of fun.